Treat and transform skin with the FOREO LUNA™ mini 2, a facial-cleansing device designed to provide a professional standard of skincare with its invigorating one-minute ritual. 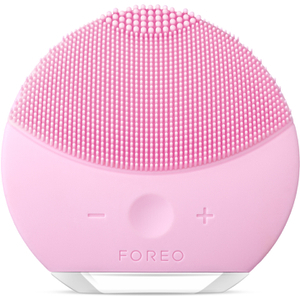 Perfect for all skin types, the facial brush inspires healthier-looking skin; helping to clear and clarify for a more luminous complexion. Combining T-Sonic pulsations with three zones of soft, non-porous silicone touch-points, the device gently yet effectively cleanses and exfoliates, helping to unclog pores and lift away dirt, oil and blemish-inducing impurities; its eight adjustable intensities allow you to customize your cleansing experience. The silicone 'bristles' are super hygienic and resist bacteria build-up to keep skin fresh and clean. Thinner touch-points gently cleanse sensitive and normal skin. Thicker touch-points for precision cleansing. Broader touch-points on the reverse side cater to oilier skin. 1 Apply Cleanser: Dampen your face and apply your favorite cleanser. Wet the LUNA™ mini 2 and turn on. 2 Cleanse:Gently glide the LUNA™ mini 2’s brush in circular motions over your face for 1 minute. 3 Rinse: Rinse and dry your face. Apply your additional skincare products as desired. 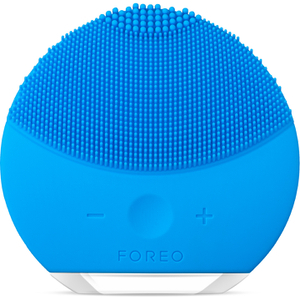 I love this facial cleansing brush because of how easy it is to use. It is a simple and fun process, it doesn't make any mess, any noise, it's low maintenance – perfect little thing. There hasn't been any irritation so far. I have been using it for a whole month and so far – so good. Best Birthday gift ever! Totally different feeling and result when using this brush. I am officially a fan of this brand now! I can't go a day without using this brush, it's become such a staple in my routine. I sincerely recommend it to everyone. These silicone bristles are soft and gentle to my face. Now that I have discovered this device I will never go back to washing my face with only hands. It is not that expensive and it is such a great investment for your skin and your happiness. This has dramatically improved how my skin looks. I bought it few months ago and never stopped using it. Great thing to have. It was by accident that I found about this beauty gadget. I went to my cousin and she was with her best friend and they were talking about how she has this gadget for a year now and how great it ts. I then went online and read about it and went and bought it next weekend. That was three months ago and I have been using it every day since then. It washes my face thoroughly and leaves my skin soft to touch. I charge it rarely and can carry it everywhere I go. I will not exaggerate when I say that I feel my skin is very different now. After couple of months in, I feel as if I got someone else's skin. Others also say that my skin is glowing and my boyfriend says it is softer. I will not stop using this small miracle maker. I got last month as I was exploring this beauty shop and thought I could give it a try. It turned out to be a hit for me. I really like the feel on my skin after using it. When I bought this device I was little confused. It was very complicated to figure out how it works. I wasn't satisfied with the directions that I got. I thought it was broken and then my friend helped me with it. I didn't expect too much from it, but I was really surprised how it worked great for my skin. This really improved my skin a lot. It is really cool how great your face looks after just one minute. The thing that I didn't like were poorly written instructions. I'm not a fan of face treatment, but I enjoy this. 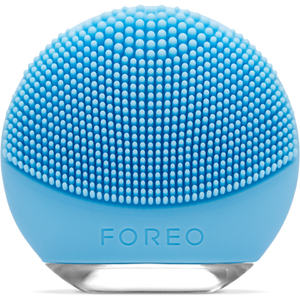 This cleansing face massager is very easy to use and will bring you the results you expect. I haven’t been using this product for a long time but it has surprised me so far. Changes are evident, my problems are slowly disappearing. I'll use it for sure in the future.